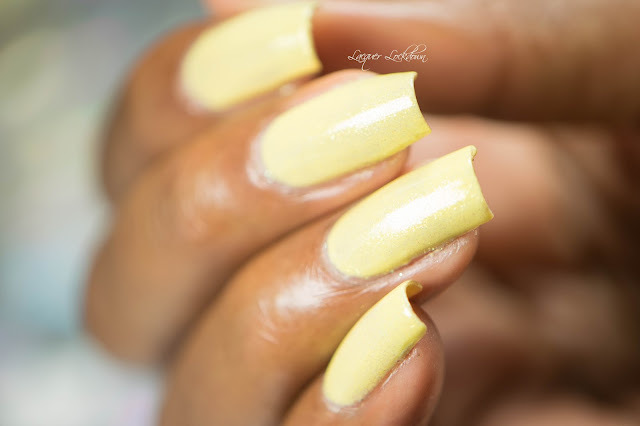 I'm back with some beautiful polishes to share with you from the latest KBShimmer Spring 2016 Collection! You all know I love me some KBS polishes particularly the Mega Flames that have released so recently so of course I was thrilled when I was offered a slot to post a few of the polishes from this gorgeous collection. I also received a mani bomb, a first for me, that I will be trying out later though I'll tell you the smell is divine! Sidenote: This is my first time using the KBS Topcoat. I was really blown away by how glossy and fast drying it was! Expect a follow up as I take it out for a spin with my stamping ;) Now onto the swatches! 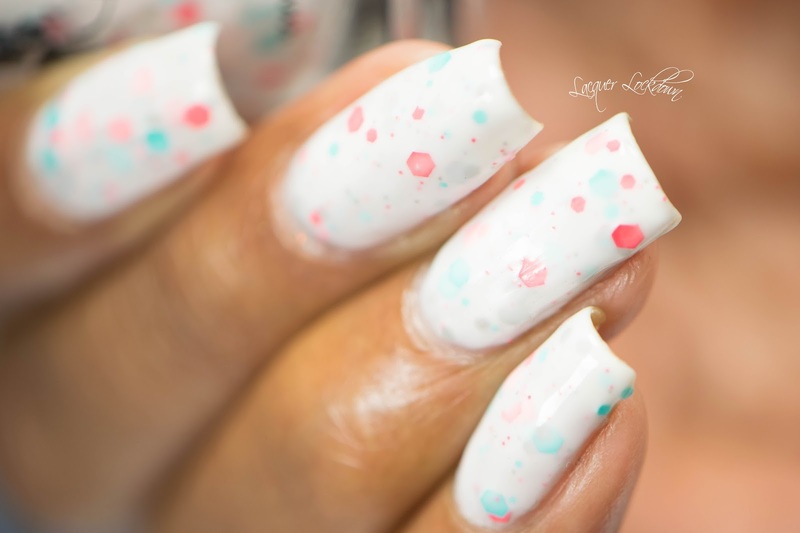 A creamy white crelly base with aqua, coral, and grey hexagonal glitters. I used 3 coats here to achieve opacity. You could probably get away with 2 coats here but I really hate visible nail line and the third coat took care of it easily. 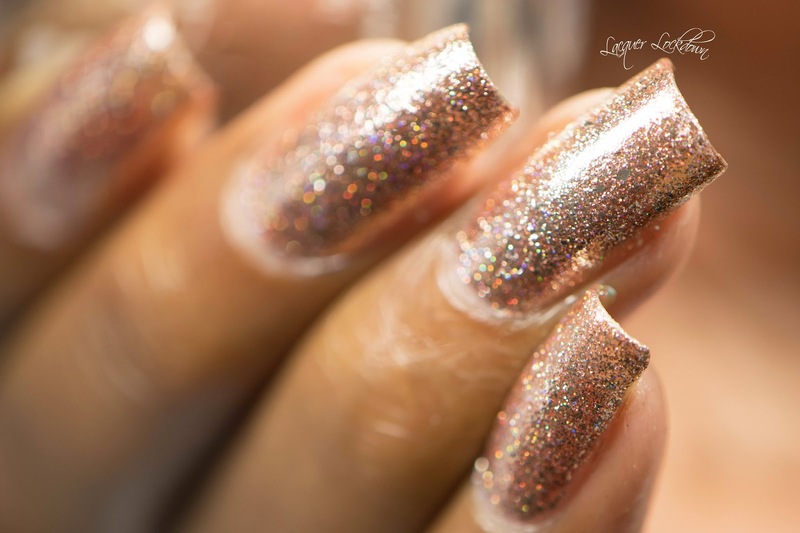 No fishing was required at all because the glitter is evenly disbursed throughout the base it was easy to lay them down as the polish came out. Surprisingly both the base and the glitters leveled off nicely by themselves and dried to a glossy finish though I still applied topcoat. 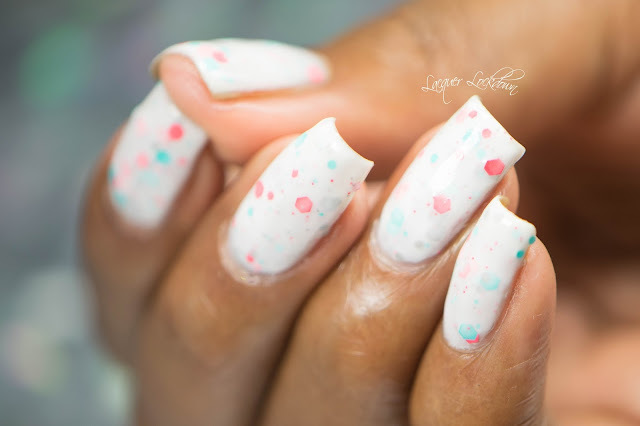 This kind of squishy yummy polish screams summer and beaches and ice cream! I love how this one looked as well with my skintone. 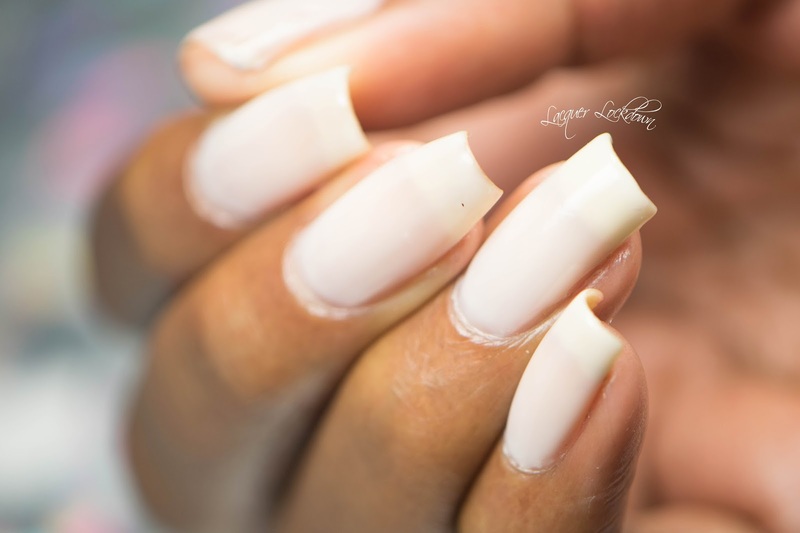 Off white smooth as silk BASECOAT. It is incredibly incredibly sheer and dries extrmely quickly. Because I am a fool I thought this was a stand alone polish so I swatched in in 5 coats to achieve opacity. Honestly I still really love this as a squishy sheer polish to be used as a crelly for making pond manis, but I wanted to clarify in case I confused some people with my error! 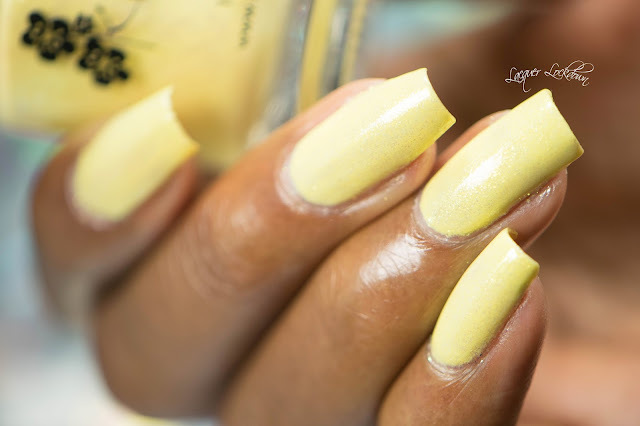 If you did choose to use this one for a crelly as a pond mani it dries extremely quickly probably because it's formulated as a base coat. IMO that's the best part. I will have to do a follow up to test how this actually works as a basecoat since I didn't use it as such here. 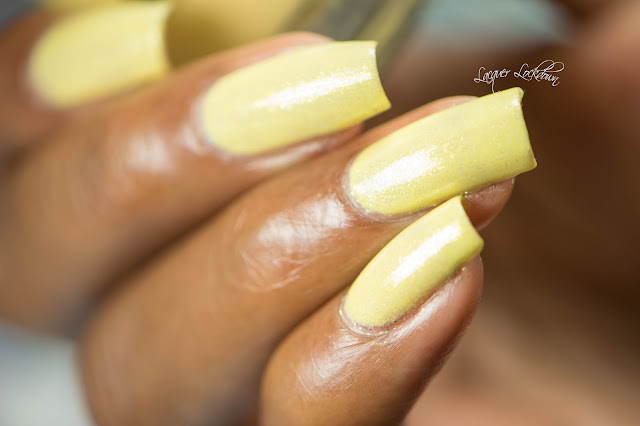 Lemony yellow polish packed with yellow and greenish shimmer. This one applies somewhat streaky as does Good Reef! since they are similar types of polish. It also required 3 coats to build up opacity. For myself these were the two polishes that were a bit fussy formula wise because of the streak factor but once the coats built up the streaks evened out. 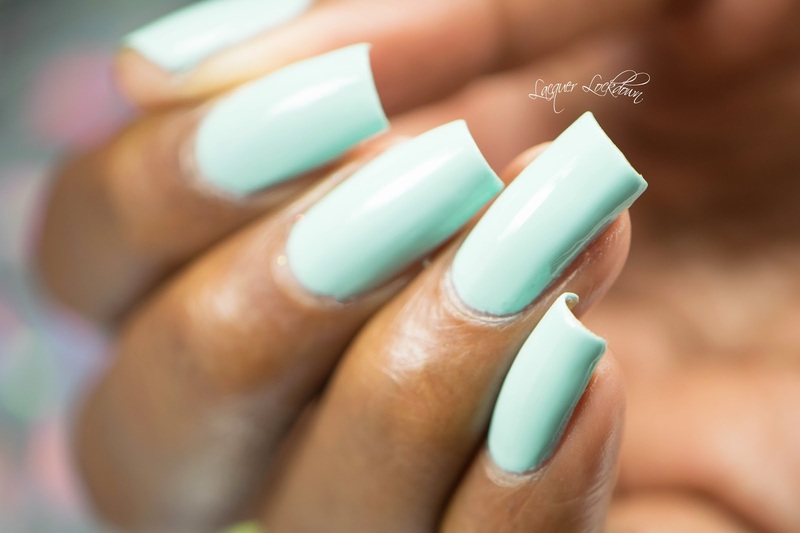 Lime green creme polish. Its a classic for the summer. Bonus points on this one and Playing With The Bouys for being so well formulated! Basically these two cremes were nearly opaque in 1 coat but I applied 2. They leveled out like a dream and essentially made me realize that the KBS creme polishes are fabulous. These are the first I've ever used and I'm loving them! 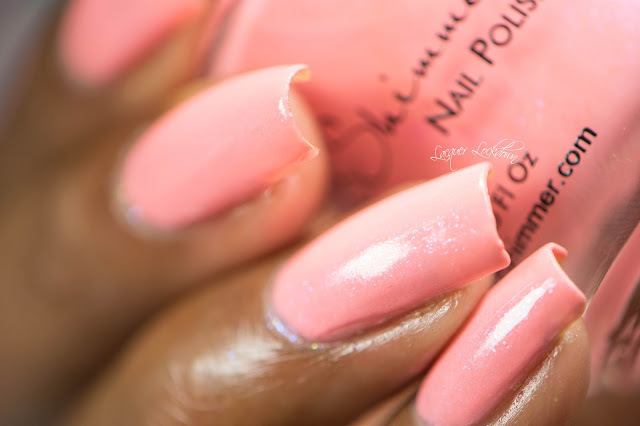 Coral pink shimmer packed with pinky blue shimmer. 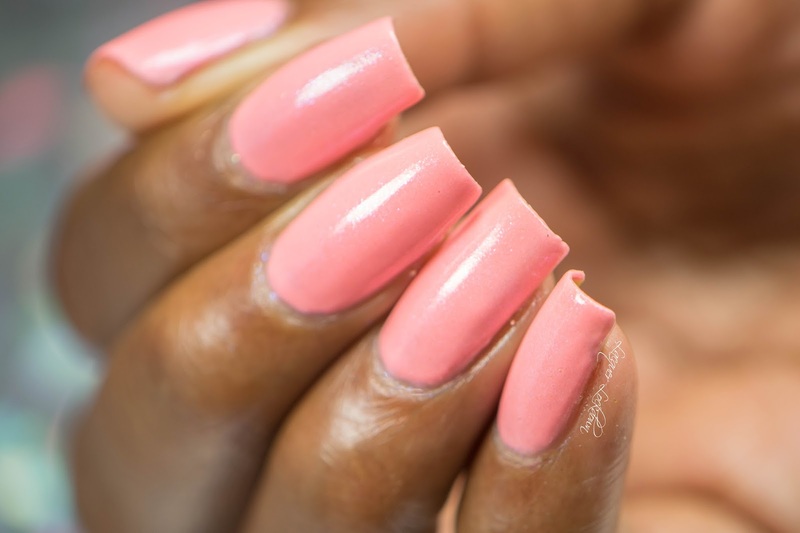 This one like Mai Tai applied streaky and required 3 coats to reach opacity. The streakiness corrected with the final coat, but was a bit fussy to work with. For whatever reason I'm not sure about how I like this color on me, but I loved the shimmer inside! 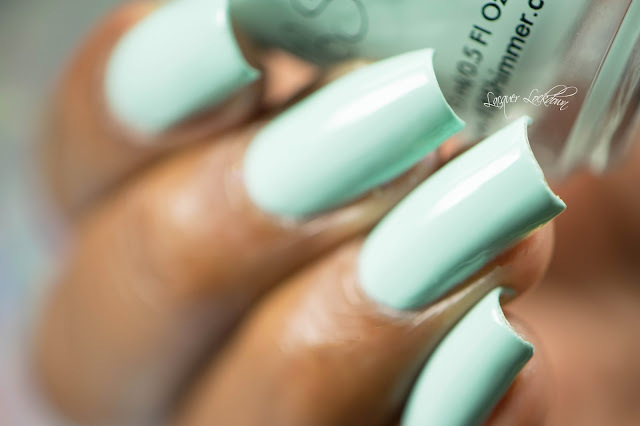 Soft blue creme polish. 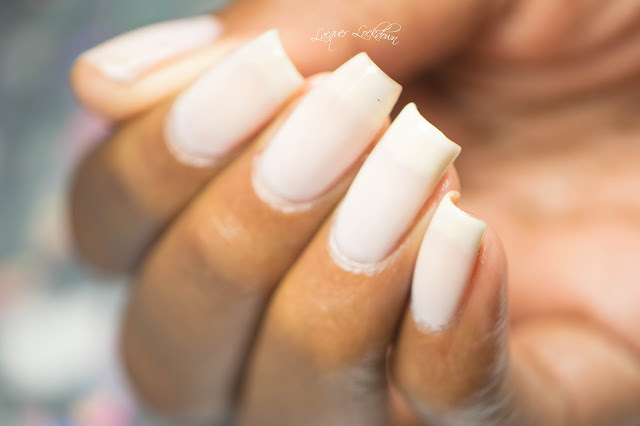 A classic that made me want to break out some of my nautical plates and create some cutesy nail art (mentally adds to list of nail art to create). Perfect perfect formulation. 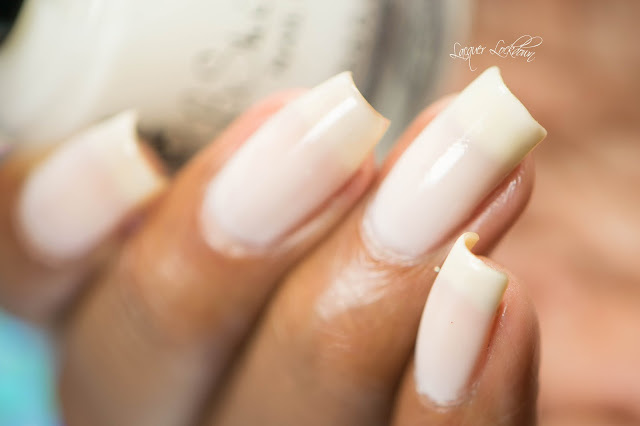 Went on like a dream seen here in 2 coats but almost opaque in one. You guys know how I feel about one coaters and nearly one coaters! Like I said these cremes were to die for perfect! Saved my favorite for last. Ok clearly I'm biased and will always be biased toward anything with holo. I like how the rainbow refracts inside and outside and when I look down it just makes me smile. 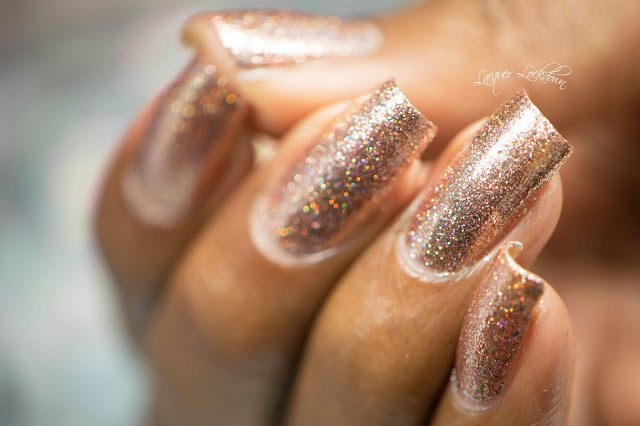 One Night is a metallic flakey copper/rose gold polish with a scattering of holo. So if its not packed with holo why do I like it so much? 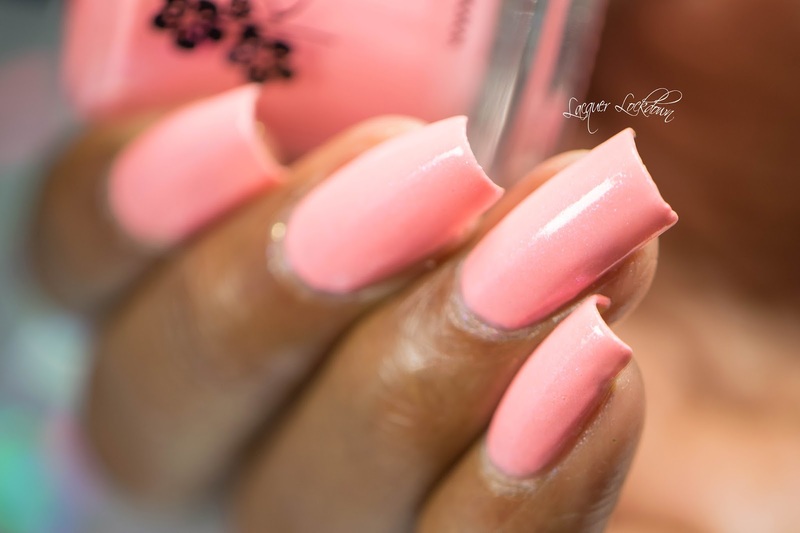 Its extremely flattering on my skin tone number one and second I don't own another polish like this one! It's finish its really unique the formula is also perfect and as such it levels out beautifully and best of all its not topcoat hungry which flakey polishes sometimes tend to be. In short what's not to love? The KBShimmer Spring 2016 Collection is available now on the KBShimmer website and Amazon.com. 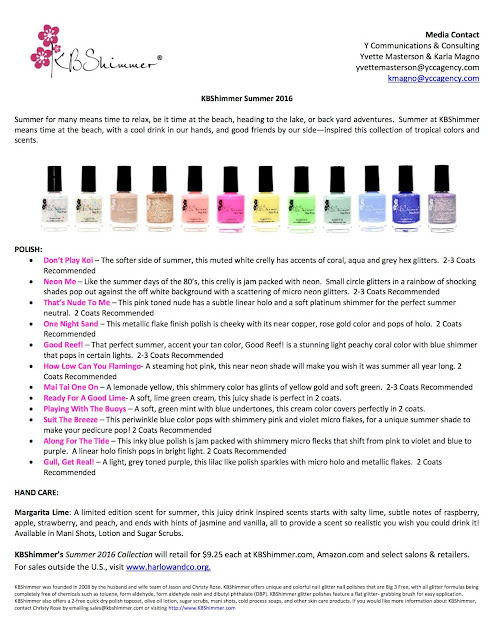 Polishes will retail for $9.25 per bottle. 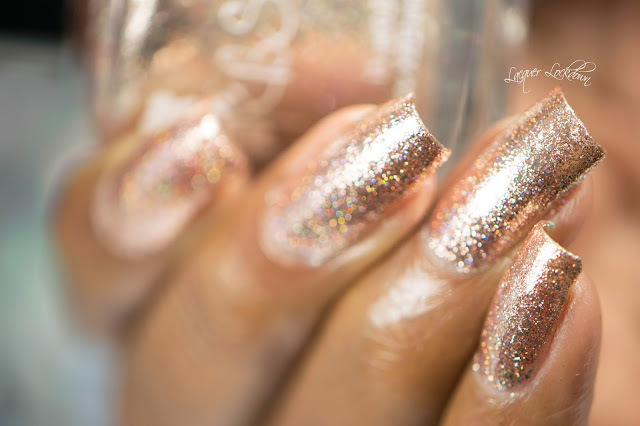 You can also find KBShimmer at select international stockists. Please definitely visit her website for more pictures of the complete collection and also see the press release below for more specific details on each polish. Happy hunting and I'll see you next post! This post contains items purchased by sent for my honest review. For more information see my Disclosures Policy.